This very fine (nearly great) vegetable is shamelessly slandered by folk who don’t understand its cooking qualities. Yes, okra rapidly goes gooey when cooked with water: but, as they say in computertalk, that’s a feature, not a bug. That mucilagenous quality is prized by those who appreciate its uses in gumbo, wherein it thickens up the soup considerably while adding good flavor. But the best way to enjoy okra properly—and without any gooeyness—is the old Southern way: coated with cornmeal batter and fried quick and deep. Ummm, ummm, good! Of all the vegetables on our lists, this out-of-Africa heat-lover is doubtless the most challenging in this climate, even more so than eggplant—but the payoff for success is so high that we’re more than willing to take that gamble. There are some newer hybrids that claim to be good for northern growing, but we’d rather grow nothing than hybrids; fortunately, there are also open-pollinated types that reportedly grow well in northern climes. Not commonly stated in the literature (or catalogues) is that okra has daylength-sensitivity that varies with cultivar; most cultivars need a short daylength to initiate flowering, though there are also long-day and day-neutral cultivars. So “days to maturity” for a cultivar may not sufficiently define its usefulness—it should be explicitly labelled as suitable for northern growing. We see on the web that some questions have been expressed about okra’s daylength sensitivity. Like Will Rogers, we only know what we read in the newspapers (well, and articles). From the University of Arkansas publication “Okra Production Update for Small Acreage Growers”: Flowering is day-length sensitive. Less than 11 hours promotes flowering in most cultivars. Under longer days, flow­ering buds tend to abort. However, “Clemson Spineless” is one of many cultivars that is not photo-period sensitive. Clemson Spineless has been widely accepted for growing in temperate regions where day length is long during the summer. One apparently wants to start okra seedlings about 4 to 5 weeks prior to anticipated plantout, which means sowing seed around May 23rd or perhaps even May 16th, a week earlier. The minimum soil temperature for okra seed germination is about 60° F., but the optimum germination temperature is 95° F. The temperature really makes a difference: at soil temperatures of about 60°, germination takes 27 days, whereas at about 75°, germination may take only 13 days, and in ideal conditions perhaps a week. Obviously, heat mats (electric “heating pads” for use under seedling trays) are a much-wanted tool here. Okra is another of those plants that really, really doesn’t want its root system joggled about, so it’s almost mandatory to start seedlings in a peat or cow pot. For best germination, soak the seeds overnight, then plant only the swollen ones. Okra is shallow-rooted and will not tolerate wet or poorly drained soils. Though it can be grown on almost any soil with good drainage, it prefers light-textured soils. All sources agree that okra needs particularly high potash content in the soil—so adding some is almost a necessity—but it doesn’t want high nitrogen content (or you will get too much vegetative growth and the expense of the wanted pods). The optimum pH range for okra is 6.2 to 6.5. Rather obviously, the bed requires a full-sun location. 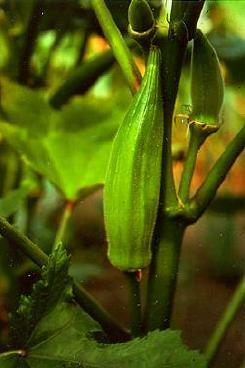 Okra should not immediately precede or follow vine crops—such as squash or sweet potatoes—owing to the risk of nematode buildup in the soil. As already noted, since okra does not like to have its root system fooled about with, so if you’re not experimenting with direct seeding, grow your seedlings in decent-sized peat or cow pots and plant the whole pot. As always with such pots, while you plant the whole thing, you need to be sure that thbe rim of the pot dowes not end up exposed to air, lest it wick away moisture from the plant; so either: cut the pot rim down to the level of the soil in it; or top up the pot to the rim; or bury the rim very slightly below the bed-soil level. Ideal plant spacing in a deep-dug or raised bed is probably 12 inches (that’s what Jeavons recommends, and one seedsman says the same, though with greater spacing between parallel rows, a planting layout that deep-bed gardeners do not use). These fellows can in theory get pretty big (in the deep south, some cultivars can reach ten feet tall or even over), but the early varieties, especially in cooler weather, typically reach only 30 to 36 inches high. We will use, and recommend, 16" spacing. Obviously, all the standard northern-gardener’s tools for augmenting warmth—plastic mulches, row covers, cloches, Walls o’ Water or water bottles—are wise choices when dealing with okra. We plant ours in our Solanaceae bed, which has red plastic mulch. Okra is tolerant of water stress (irregular watering), and in fact one has to be very careful not to over-water it or it will give you nice flowers and puny pods: the equivalent of an inch a week is about right. It is best to water slowly and direct at the base of the plant, which obviously suggests drip lines or at least soaker hoses as the ideal approach (as it is for almost all vegetables). Okra left to its own in benevolent conditions can easily grow to 8', 9', and in a few cases almost 14' in height, to the extent that it is almost a joke (and literally requires a ladder for picking). Not a few okra veterans feel that cutting okra off at some convenient height (“topping” it) not only keeps it from growing too high, but also encourages extra side growth and, arguably, an increase in net crop. If your’re going to try this, make sure you might space the plants adequately: at least 15" and maybe even 18" if you have space, lest the bushiness get them to crowding out one another. Once flowering starts, pods form very quickly, typically in 7 to 10 days. Once pods appear, watch it closely and pick daily as pods become ready—frequent picking encourages further pod formation. Pods should be picked while they’re still tender, before the seeds are half grown; as a rule, that’s about 5 or 6 days after the pod first flowered. Pods with tips that will bend between the fingers without breaking have become too tough, but if you missed them before pick them anyway, to keep those new pods coming. Remember: the pods rapidly become fibrous and woody, and so must be harvested within a week of the fruit being pollinated to be edible. Caution! Okra plants, and pods, often have numerous small spines; those can irritate anyone’s skin, and moreover some people are outright allergic to them. Always pick okra wearing a long-sleeved shirt and gloves. (That’s highly recommended even with so-called “spineless” okra types.) A light washing of the pods will remove the spiny hairs, and okra can then be eaten fresh (though it is usually cooked). Fresh okra bruises very easily, the bruises blackening within a few hours. Though the defect is mostly cosmetic, take care in handling the pods during harvest. As we often say under this heading, there’s no point in re-inventing the wheel: here’s a fine history of okra. “Gumbo” is the old African name for okra, today transferred in the English-speaking world to the name of the famous New Orleans cajun-style soup. Okra is also featured in the cuisine of India, where it is called bhindi. Irmo, South Carolina, hosts an annual Okra Strut. There is a “Song to Okra”, whose complete words are available on line; it is unlikely that you will hear it on MTV any time soon. It was last modified on Thursday, 31 January 2019, at 17:19 EST.